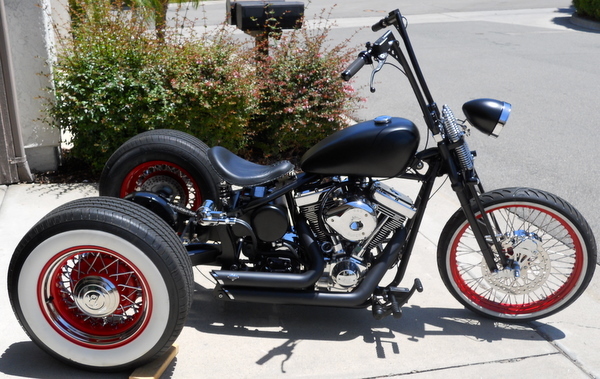 Bobber Trike or Chopper Trike? The Showdown: Bobber Trike Versus Chopper Trike! It is an amazing fact of life that people have their own distinct individuality. We all have our own preferences in all aspects of life; how we dress, how we talk, what type of person we are, etc. This is why when it comes to motorcycle, specifically Trikes, it is no surprise that people still have their own preferences to choosing an ideal trike that best suits their individual preferences. Take the Bobber and Chopper Trike as an example. These trikes are Yin and Yang, opposites that people seem to prefer one over the other. One is flashy and one is substance. Which trike are you? Read this guide further to find out. If you prefer simplicity over flash and if you are a no-nonsense type person, the Bobber trike may be suitable to your personality. Bobber trikes are motorcycles that are stripped down of parts that purists believe are unnecessary for a motorcycle to operate. Many purists even believe that these extra parts only work to obstruct a motorcycles performance on the road. 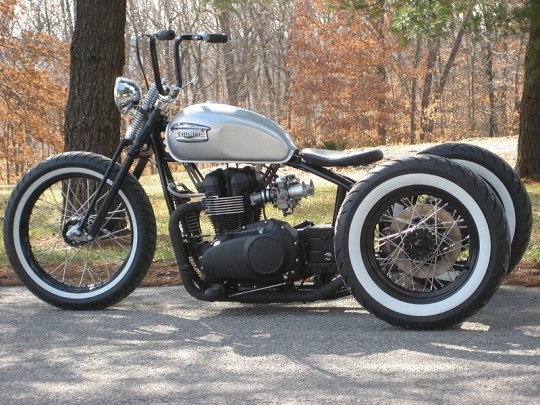 Whether they are right or wrong, bobber trikes are still a favorite of many trike aficionados. Let us see the characteristics and features of a Bobber trike. Fenders. Bobber trikes actually lack this feature. The reason why this type of motorcycle lacks anything resembling a fender is to increase speed and performance. With many type of trikes, a fender is a requirement as it adds style and personality. Keep in mind that trikes are part motorcycle and part car. Many people who own trikes usually prefer their vehicles complete with a bumper. Customization. Another characteristic of most Bobber trikes is the lack of customization, specifically chrome finishes and elongated grills that you see on many custom motorcycles today. Bobbers were created from the motorcycles used in World War II. These motorcycles were sleek and designed to be light in terms of handling and performance. The lack of customization for Bobber trikes leads many to believe that this type of motorcycle is substantially cheaper in cost as compared to Chopper trikes. If you have a flashy personality and prefer your motorcycles containing loads of features, equipment, and customizations; the Chopper trike may be your ideal vehicle. Chopper trikes are basically Frankenstein in motorcycle form as they were once regular motorcycles that have been Chopped-up and rebuilt with numerous customizations, enhancements, and features that make them vast improvements of their former selves. Chopper trikes provide a chance for people to really express their personalities as they allow chrome finishes, customized painting, body modifications, you name it. Let us take a look at some features that you will find on a Chopper. Fenders. It is a must for Chopper trikes to have a fender. They even have all the features a person would actually want in a bike. Customization. Choppers take the proverbial cake when it comes to customization. Usually Chopper trikes have long front ends that extend to the front wheel. Many times these front ends have extended forks that add to the bike’s rake angle. Choppers also normally have frames without rear suspension, yet, today many people seem to prefer theirs with suspension. Handlebars are also a must as Chopper trikes have either very long or very short handlebars that the owners customize their bike with. 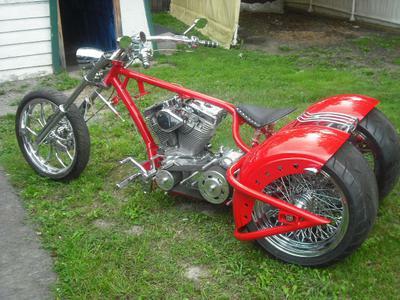 Another must with Chopper trike customization are known as “Sissy Bars”, which are tubes that extend from the motorcycles frame to the rear bumper. Advantages of Bobber and Chopper Trikes! Owning any of these two types of motorcycle trikes have their own sets of advantages. It really depends on what you place importance on as a motorcycle driver. As previously stated, Bobbers are stripped down, while Chopper trikes contain all the works. For people who are just getting into motorcycles, let us take a look at some advantages of both Bobber and Chopper trikes. More affordable. Bobbers are stripped down and contain substantially less parts than a Chopper. This means that owners and buyers do not have to spend regularly on new gear and body parts. The only time that they must spend is when they need to have a repair done or to replace an existing part. They ride faster. Even with most V6 and V8 Chopper trikes, the abundance of customization, body parts, and other features can play a significant role in making the bike extremely heavy. With Bopper trikes, this is never a problem because of the lack of these extra features. 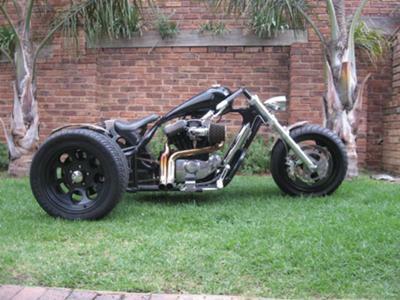 You can expect your Bobber trike to ride faster than a Chopper trike with the same engine and power capabilities. Easier to maintain. Since you really do not have that many features on your trike, maintenance should be a very easy task as you simply have your bike checked regularly for oil changes and electrical issues. Other than that, you will not spend a lot of time for repair and other maintenance. About the only advantage that Choppers have over Bobbers is the ability to customize your bike with numerous upgrades, and customization. These changes cost a lot of money and even maintenance has to be factored in. If you do have the budget, then you should have an enjoyable time owning a Chopper.